FMF - Friends of Minerals Forum, discussion and message board :: View topic - The Paraiba controversy rages on! Posted: Apr 10, 2008 04:39 Post subject: The Paraiba controversy rages on! 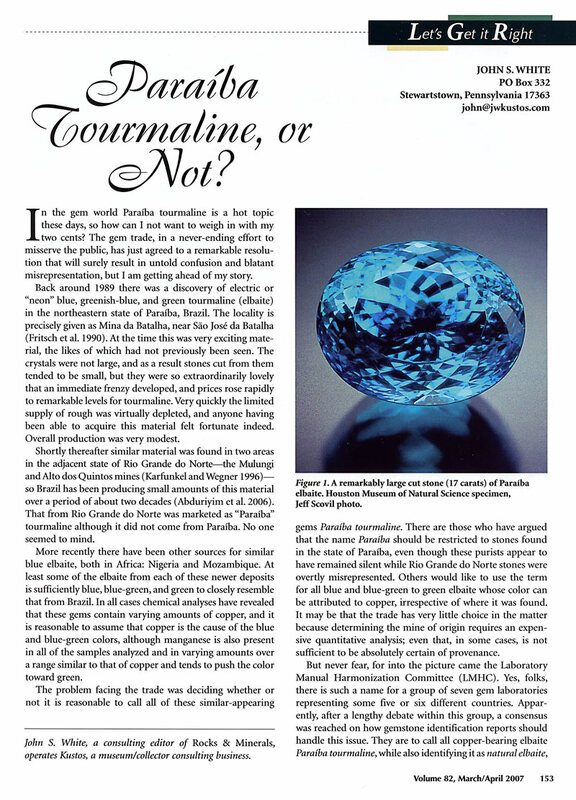 Has anyone seen the latest article in JCK Magazine about a Paraiba tourmaline company potentially suing the AGTA and GIA over the extension of the name "Paraiba tourmaline" to all cuprian elbaite regardless of origin? Apparently, the debate on what is a Paraiba tourmaline rages on! Posted: Apr 10, 2008 05:20 Post subject: Re: The Paraiba controversy rages on! For me the answer is very easy: "Paraíba Tourmaline" mean Elbaite (Tourmaline) from Paraíba, that's what its name say. Other cuprian Elbaites (Tourmalines) from other places could be named: "Cuprian Tourmalines looking like the Paraíba ones, but not from there" ;-), or to simplify: "Cuprian Elbaite". Anything new about the "elastic" names used by the world of gemstones. John wrote a wonderful article about it on Rock & Minerals, when he be back from his trip maybe he could add something. Posted: Apr 10, 2008 09:12 Post subject: Re: The Paraiba controversy rages on! Thanks for your input, Jordi! 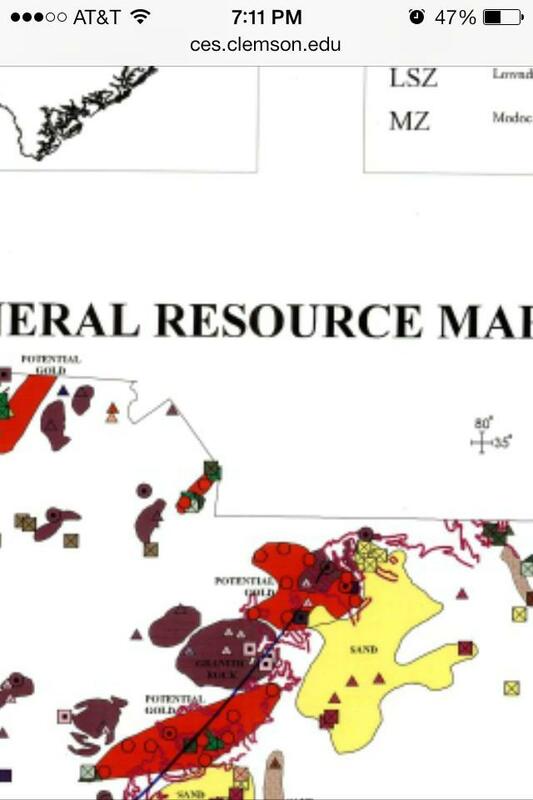 Locality can be an important determinant of value for mineral specimens, as well as for gems (e.g., Burma vs Vietnam ruby; Colombian versus Brazilian emerald, etc.). 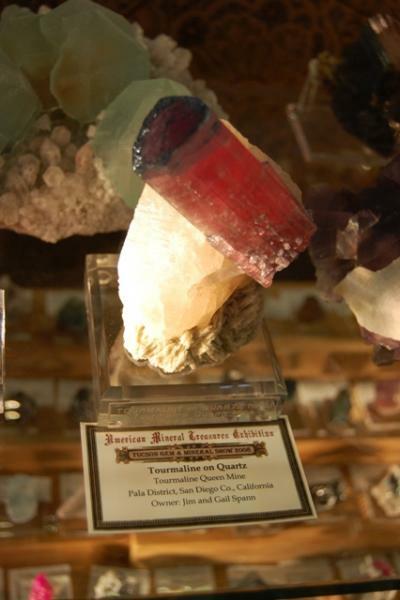 Mineral collectors probably value cuprian elbaite from Brazil higher than from specimens from other sources, but it seems to me that only the most serious gem connoisseur would care about locality. Color and quality are the foremost considerations to gem buyers -- it often does not matter where the material is from. In fact, one of the most well-known and advanced gem collectors in the world has told me more than once that he never pays premiums for localities! Mineral collectors would be flabbergasted at such a notion. Posted: Apr 10, 2008 11:19 Post subject: Re: The Paraiba controversy rages on! Another gem mineral name like this that comes to mind is "Siberian" amethyst, used for a particular (hope I'm saying this right) vivid red-purple shade of amethyst. It think it is fair to say that this term has become generally used for any amethyst of this shade of color, regardless of its place of origin. Searching for this term on the web, the first website I encountered that described & pictured Siberian amethyst stones, gave"place of origin = Africa" for them. Now of course, careful and more professional and scientific writers, would still put "Siberian" in quotes. Happily though, this problem mostly applies to gemstones or gem material, rather than mineral specimens, so no one is going to refer to a MINERAL specimen of blue cuprian elbaite from Africa, as Paraiba Tourmaline. They might refer to it as "Paraiba-type tourmaline", which is fine. Posted: Apr 10, 2008 11:49 Post subject: Re: The Paraiba controversy rages on! I think that this is going to be an ongoing problem as the demand for gems grows. The TV Shopping Channels have added a huge audience to the world of gems & jewelry. As well as the advanced prospecting and mining techniques being used in 3rd World Countries...it is going to be an issues with many different gems. I have heard there are rumblings about the "Tahitian Pearls" they are growing off the Southern Coast of Australia! ...and what about stones that have their originating location as their name! Spessartite, Tanzanite, Bytownite....etc! As far as Paraiba Tourmaline - these new finds have also opened new opportunities for the mines in Paraiba, as we now think of Paraiba Toumaline as any Copper Bearing Tourmaline - not just the Neon Aqua! Posted: Apr 10, 2008 12:34 Post subject: Re: The Paraiba controversy rages on! Posted: Apr 11, 2008 01:37 Post subject: Re: The Paraiba controversy rages on! Gemmology (or, more comcretely Jewellery, may be?) seems not specially careful with names and localities. I add the habitual treatments to accentuate or simply change the color. Paraiba Elbaite is not an exception. But this methods seems to be more and more exported to the especimens of mineral collection. Last Munich show offers a lot of Pakistan turmalines thermically coloured. Some dealers advert it, but not some other. Posted: Apr 15, 2008 08:31 Post subject: Re: The Paraiba controversy rages on! Herewith attached you could find the interesting columns wrote by John S. White about Paraíba Tourmaline. Posted: Apr 15, 2008 08:50 Post subject: Re: The Paraiba controversy rages on! If a polar bear is born in a zoo in Australia, is it still a polar bear or not? Posted: Apr 15, 2008 08:58 Post subject: Re: The Paraiba controversy rages on! Of course is it Alfredo, but is not an "Alaskan polar bear" but just a polar bear. Problem with Paraíba Tourmaline is that its name includes not only the species name but also its location. Posted: Apr 15, 2008 09:19 Post subject: Re: The Paraiba controversy rages on! Exactly, Jordi. But "alaskan" is an adjective describing where the bear came from; it's not part of the species name. So we need to decide whether "paraiba", "herkimer", etc., are locality adjectives, or part of a genuine distinguishable variety name. If it's a locality name, then using it for something from somewhere else is fraud. But if it's part of a varietal or species name, it can legitimately be used for material with the same chemistry/structure/appearance from anywhere. There is a difference between a varietal name and a locality label. The proponents of the "uniqueness" of herkimer-type quartz from Herkimer are trying to have it both ways - they want the name to be both a locality label and a varietal name, simultaneously. Brazilian gem dealers want electric-blue tourmalines from anywhere in northeastern Brazil (not only Paraiba) to be called "paraiba tourmaline", but deny this right to electric-blue copper-bearing tourmalines from elsewhere. That is strictly a commercial brand-name issue they can argue in the courts, but it has nothing to do with mineralogy, gemmology or any other science! Personally, I don't use varietal names at all - they are just "quartz" and "Cu-bearing tourmaline" in my collection. Posted: Apr 15, 2008 10:30 Post subject: Re: The Paraiba controversy rages on! Norway Spruce (Picea abies), Siberian Husky (recognized by the AKC as an official breed), Baltimore Oriole (Icterus galbula), Canada Goose (Branta canadensis), Chilean Sea Bass/Patagonian toothfish (Dissostichus eleginoides), Swiss cheese, Spanish omelet, Turkish coffee...what a slippery slope this is. Zoos do not post signs identifying California Condors as "black vultures with patches of white on the underside of the wings and a largely bald head with skin color ranging from yellowish to a bright red," and restaurants do not list on their menus "a style of pork sausage which is noted for its seasoning of fennel and/or anise, containing at least 85% meat" rather than Italian sausage. Do varietals qualify as legitimate parts of names, even if common names only, or simply as descriptors? I doubt there's one "correct" answer here. Posted: Apr 15, 2008 11:34 Post subject: Re: The Paraiba controversy rages on! All very interesting and amusing and curious. Hearkening back to my earlier comment about champagne, I often still get a chuckle when I think about a vignette from one of the radio episodes of Garrison Keillor's "Prairie Home Companion". His character is dining at Lake Wobegon's only erstwhile gourmet restaurant, the Café Boeuf, and he is telling the snooty French waiter "Why don't you carry any Oregon Chardonnays, they are pretty good". The outraged waiter sneers to him, obviously barely controlling his temper, "Oh, so then tell me, Monsieur, just where is this place in Oregon called, "Chardonnay"? " One could do the same skit about Paraiba tourmaline, etc., but I guess the mass of the people would not comprehend the humor. Posted: Apr 16, 2008 13:37 Post subject: Re: The Paraiba controversy rages on! Posted: Apr 16, 2008 13:48 Post subject: Re: The Paraiba controversy rages on! It is made with Chardonnay, with an special process. And a grilled seabass with a Chablis, should be a sin. Posted: Apr 16, 2008 14:49 Post subject: Re: The Paraiba controversy rages on! Posted: Apr 17, 2008 03:55 Post subject: Re: The Paraiba controversy rages on! Well, the joke ia really excellent, and I am still laughing. I know about that of chardonnay and chablis for a circumstance that involves more cooking than minerals. If Jordi lets me explain, I will place. I laughed also a lot! On the other side, Pete, I would like to know only a small fraction of what you know in minerals! Posted: Jun 12, 2008 17:56 Post subject: Re: The Paraiba controversy rages on! 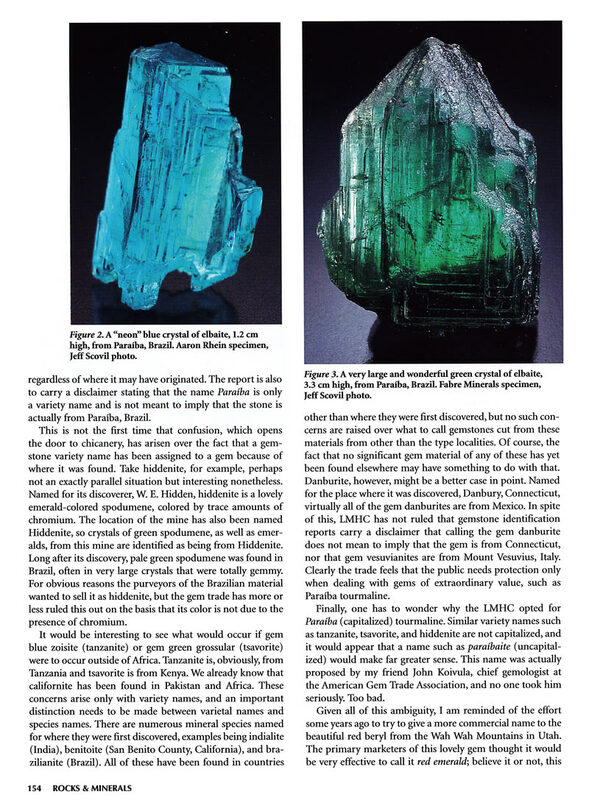 In an eight-page letter, Thomas E. Shuck, representing the American Gem Trade Association’s law firm Parker Milliken, details reasons why the name Paraiba can be used both as a locality and a color variety. The letter demands that John P Hannon II, attorney for David Sherman and Paraiba(dot)com, drop the complaint or "suffer consequences." Sherman objects to a move by AGTA and laboratories that belong to the Laboratory Manual Harmonization Committee concerning the name Paraíba. His suit claims that they have taken the locality origin classification Paraíba tourmaline and redefined it as a color variety classification, paraiba tourmaline, for similar gems found in Mozambique and Nigeria. Shuck points to that he defines as current trademark constraints. “Since Paraiba was originally a place name, it is not subject to trademark unless it has achieved a secondary meaning beyond its being the name of a place,” writes Shuck. He then points out that Sherman himself is trying to “register the word mark ‘Paraiba,’” suggesting that Sherman himself believes there is already a secondary usage of the name. “Based on Mr. Sherman’s assertion that ‘paraiba’ has achieved a secondary non-geographic meaning, as my clients maintain clearly it has,” writes Shuck.